A recent article in Science magazine discussed the windows of learning which every person experiences early in their life. Development of the senses begins before birth and the language window begins in infancy and closes early in childhood. That is why a second language is so hard to learn if one begins much past nine or 10 years of age. My special interest as a teacher is the window of higher cognition which begins early in childhood and gradually diminishes by adolescence. It is surprising that so much of the plasticity and ease of learning occurs during childhood, and I think that a major mistake is made by the educational establishment in NOT taking advantage of this opportunity to develop and enrich one’s learning skills early on. It is much harder to develop these skills as one nears puberty and beyond. It is a mistake to underestimate the capacity of a young child to handle complex higher cognition learning. So how should a school system go about incorporating a strategy to take full advantage of this opportunity. I have a simple plan to jump start this process at minimal cost and disruption of the current schools. My main concern is the crucial time period when young children learn best how to think. The window of opportunity for preparing them for a lifetime of learning is early on, and the experience of learning must be designed to bolster the mind’s ability to learn and remember. 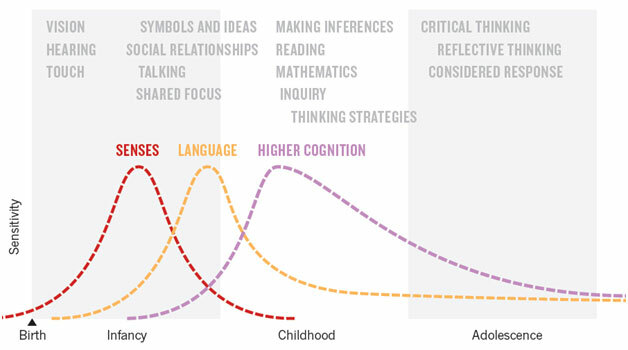 My guess is that the easiest way to deepen neural connections in a young person is to help them become actively involved in what they are learning, to help them develop precision hands as they practice thinking. To accomplish this we must show them how they can knowingly affect real time change by manipulating strings or instruments. Tactile manipulation insures the attention necessary for the student to be actively engaged in the learning. But the activity should be a successful learning. The student should be most changed by a growing self confidence in their ability to learn hard things. The finer the appreciation of dextrous finger dances the more neural pathways are affected. Instrumental music and string figures are two immediate and crucially necessary early-on-learnings for all human children. The children will eventually persevere to succeed and often beyond their fondest dreams of success. If however, you take away the ability to affect change, i.e. if there is no immediate visual update, no auditory or visual readout of success, the child is less engaged and will lose interest. And I believe the finer the motor control accomplished here the more engaged the child is, and the more neural pathways are positively affected. It will be interesting to see if having more voice control on computers will eliminate the experience of tactile feedback. Once real-time dictation is perfected, will people still type? And who now writes by hand? Once voice commands are perfected, will people still want to touch the screen to manipulate their data? Never mind, I just answered my own question. Real-time dictation will probably be a big win. And here is the crux. I believe we are a hand animal before we are a talking animal — I mean in the way we evolved this marvelous jelly in our crania. The issue is not so much how we manipulate our gadgets but ultimately how we learn to think and make sense of the world as we mature. If we are to educate and train the young effectively, we must interface with the parts which matter the most in best putting the thinking apparatus together. I think the hands are denigrated in our children’s maturation process to our detriment. What I found as I taught string figures to those falling behind in their academics was that they blossomed when they found their precision hands. That is what I said to myself when I tried to characterize the imaginative and learning processes they had developed in my class. The complex beginnings of string figures had given them precision hands. I went to investigate and taught sixth graders and dealt with those who were having trouble there, and found again that they blossomed when they found their precision hands. My children and grandchildren are off the charts in their abilities and their academics, not because of genetics so much (I believe) but because they learned string figures and the violin early on. I have been involved with teaching string figures to children and teenagers for more than thirty years and have come to some hard and fast conclusions. • The hands (especially intricate finger patternings) are a remarkably useful tool for the flowering of the brain’s potential. • Children and teenagers who participate in learning activities using the hands (playing instruments, learning string figures, etc.) do much better in learning all other subject matters than those who have no such experience. I taught in Music and Art high school in New York City and the instrumentalists tended to be the best all round students. • It is crucial that this training start early and then continue throughout the time period when the human animal is predilected to learn (say four to 24). • I believe the brain’s explosive growth in the evolution of humans was first led by the hands and only later by the throat, tongue, larynx speech acquisition. The first five years of formal schooling should be for preparing the basic systemic neuronal capacities. Then comes an extended time for learning. This period of time is necessary for all the complex modalities of the adult human to become fully developed. It is crucial that a there be a concentrated effort in learning how to learn and learning the richness of man’s cultural heritage. We all like to be smart, but learning new things can look to be too hard unless one has a history of successful learning to give one the courage to persevere into new challenging spheres. So it is crucial that we try to impart a truly understood accomplishment in learning early on. Children should learn instruments and make music. Children should learn string figures.